How does the Crypto Miner work? Cryptocurrency mining is the process of verifying transactions and adding those to a public ledger, known as the Blockchain. This is achieved by using your computer processing power to solve mathematical problems, and in return miners are rewarded with cryptocurrency. What is the Crypto Miner? Crypto Miner is the software that Freedom! created that enables users to mine crypto currencies and get access to a new revenue stream. Is the Crypto Miner available only for Freedom! Partners? No, the Crypto Miner is available to everyone who has/creates a Freedom! account. Can I use the Crypto Miner if I'm in a country where there are bans on cryptocurrencies or where it is not legal tender? As indicated in the end user license agreement for the Crypto Miner, its use is at your discretion but you must follow applicable laws, rules and regulations, including potential tax implications. So please do your research as the legal status and allowed usage of bitcoin and other cryptocurrencies varies substantially from country to country, and is continually evolving. This Wikipedia article is a good starting point to understand the status, regulations, and bans for bitcoin in particular. How do I get access to the Crypto Miner? Login to your Freedom! 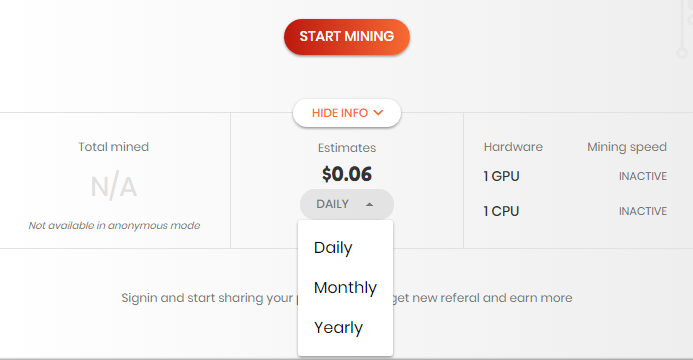 account, click the "Earn More" menu, and then in the Crypto Miner. Then, click “Download Crypto Miner” at the top of the page. 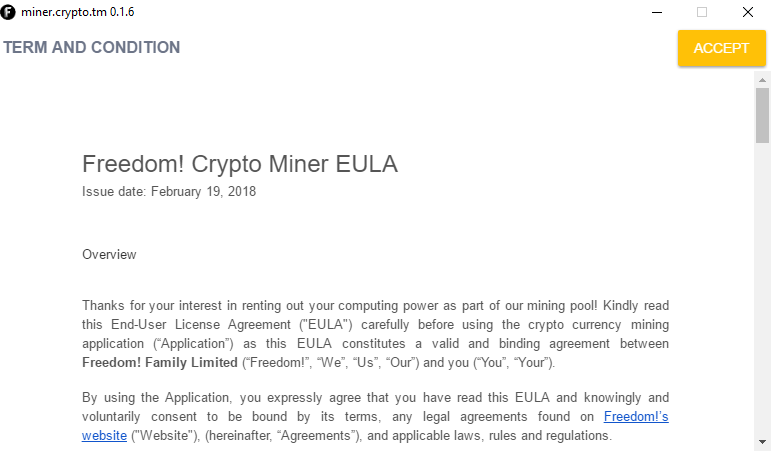 Is there an agreement I should sign before I start mining? When you first install and start the Crypto Miner you will have to accept the click-through agreement to proceed. You can find a copy of the agreement here as well. What currencies can be mined with the Crypto Miner? Click the three dots icon at the top right corner of the window of the app and then select "Settings". 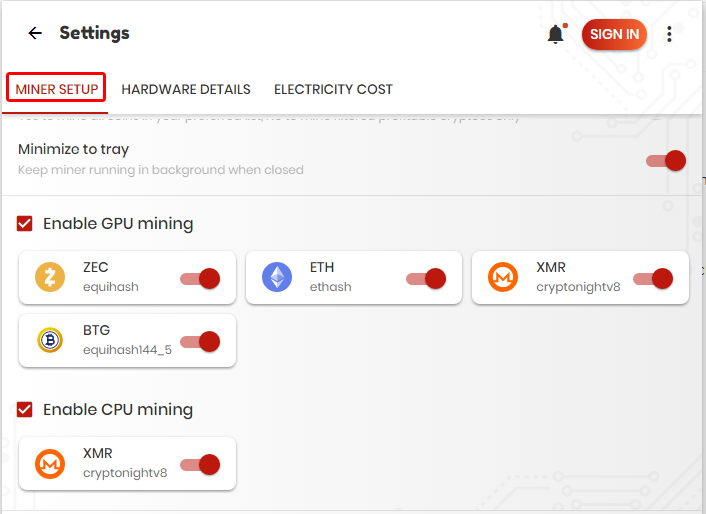 In the "Miner Setup" tab, you can select which cryptocurrencies you want to mine. What hardware/OS do I need to mine cryptocurrencies with the Crypto Miner? In some cryptocurrencies, CPU mining is also available. We plan to offer support to other Coins, and also Mac OS. For updated information about the hardware limitation of the Crypto Miner, please check the Crypto Miner page on the Freedom! dashboard. 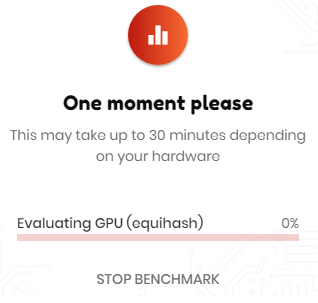 How do I benchmark my computer with the Crypto Miner? Click in the three dots icon at the top right of the software window, and then in "Settings". Select the "Hardware Details" tab. At the bottom right corner of the window, click "Start Benchmark" and wait for the process to be completed. How do I start the mining process? 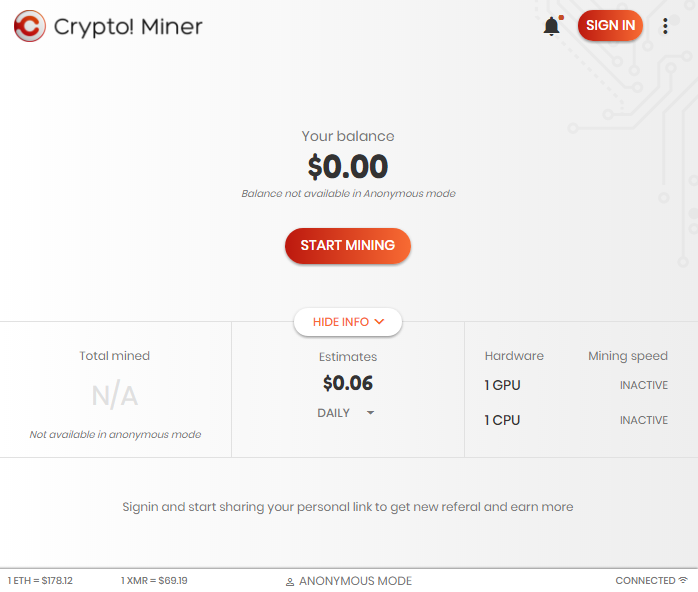 Click in the Crypto Miner, under the "Earn More" menu on the left. Click in the “Download Crypto Miner” at the top of the page, according to the version of your OS. Install the software by clicking in the downloaded file. Read the Terms and Conditions and click accept if you agree. The software window will open. For the first time running the software, you can benchmark your computer to have a more accurate estimation, by clicking in the three dots icon at the top right of the software window, and in "Settings". Make sure you click the Sign in button, so that all the information is logged into your account. Click in the "Start Mining" button at the center of the window. I have limited bandwidth available, does the Crypto Miner consume a lot of bandwidth? Actually, the Crypto Miner consumes very little bandwidth, because most of the time is consume in solving the complex math problems with your hardware and only the results are sent back through the internet. Cloud Mining is not available and we don’t have a plan for providing the service at the moment. Can I mine with a VPS? Not at the moment and is not planned. Additionally, VPS usually has very low power CPU, has a lack of GPU and the price of the VPS is usually more expensive than the crypto currency that would be earned from mining. I want to mine 24/7 and earn as much as possible. What is the recommended configuration for my mining hardware? The cryptocurrency is a volatile market, and because of that it’s not possible to recommend a specific configuration as it may be outdated the next minute. Buying hardware for mining is the same as investment in the stock market, you should do your own research and know your limits. We are not able to provide advice/guidance in these areas. Where can I find more information about the Crypto Miner? You can watch George's videos incuded in this playlist. How does Freedom! pay me for the cryptocurrency mining? The only available option is to be paid in cash, using the payment options that we have available in the dashboard. The payments follows the same schedule as the one for our YouTube partners. In future iterations of the software users will be able to choose to be paid in crypto currency as well. Where do I see my Crypto Miner earnings? You can see your Crypto Miner earnings in the Freedom! Dashboard, in the "Earnings" page (when available) and also in the Crypto Miner app. If I have Advance Payment enabled in my Freedom! account will I be deducted a 3% fee? No. The Crypto Miner earnings are not subject to Advance Payment fees. How much money can I earn using my hardware with Crypto Miner? The amount of money that you can generate with the Crypto Miner will depend on the processing power of your hardware and the amount of time that power is spent mining. You can get an estimation on your potential revenue by checking the info under the "Start Mining" button, at the main screen of the software. What is the revenue share for the earnings generated by the Crypto Miner? The revenue share for all the earnings generated with the Crypto Miner is 90/10 (90% paid to you, the miner). I used the Crypto Miner but it didn’t generate any earnings. Why is that? The device you are using to mine uses a low-end card that it is not able to produce usable hash result by the mining pool. To produce a valid share of hash that can be accepted/registered by the mining pool, it takes about 10 minutes (on average). You may not have run the Crypto Miner for long enough. 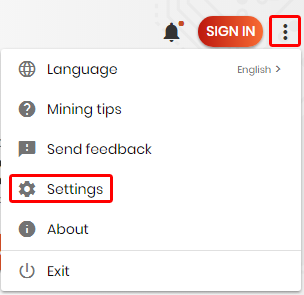 When you use the Crypto Miner, there is a notification indicating that you need to be logged-in into your Freedom! Account (by clicking the Sign In button in the app) or else we won’t be able to pay you. If you were not logged-in when you were mining, that information was not registered into your account. If you believe that these scenarios do not apply to you, please click the three dots icon at the top right corner of the app, and then select "Send feedback" to report the issue (make sure you have signed in to your Freedom! account using the Sign In button, before you send feedback). Once you do that, please contact our support team to let us know you have submitted feedback so that we can investigate further. My ETH earnings have not been paid. What’s wrong? Payments for ETH earnings are sent out when they reach a certain threshold. In the meantime, the ETH will remain in your account. You will be able to check your balance and see all the different crypto amounts remaining in your account. I have a video card that should be supported, but it is showing that I don't have a video card, what can I do? Please make sure you are running the miner program directly on the machine or try out teamviewer. Other types of remote desktop (VNC or windows remote desktop etc.,) are known to have compatibility issues with the miner application. I found a bug or have an idea on how you can improve the Crypto Miner, how do I contact you? 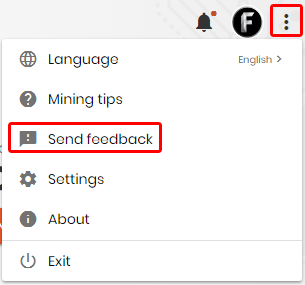 When you have you Crypto Miner open, click the three dots icon at the top right corner of the app, and then select "Send feedback" to report the issue. You can include an image as well. Make sure you have signed in to your Freedom! 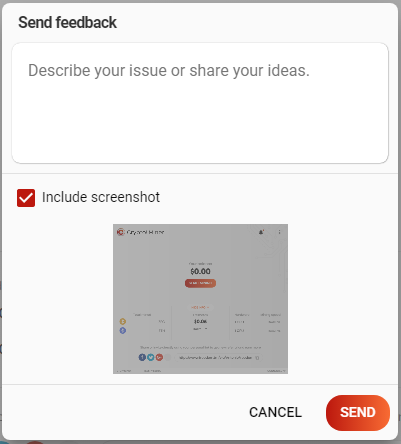 account using the Sign In button, before you send feedback. The "Start Mining" button in the Crypto Miner is not available or not working, what do I do? This will optimize the Crypto Miner to use the correct hash algorithm specifically for your hardware. Also make sure that you have compatible hardware and OS (you can check in our dashboard, in the Crypto Miner page) and that if you have an anti-virus, it's properly configured so that it doesn't block the Crypto Miner. The Crypto Miner stopped working and my Anti-virus is now moving the program to quarantine. What should I do? 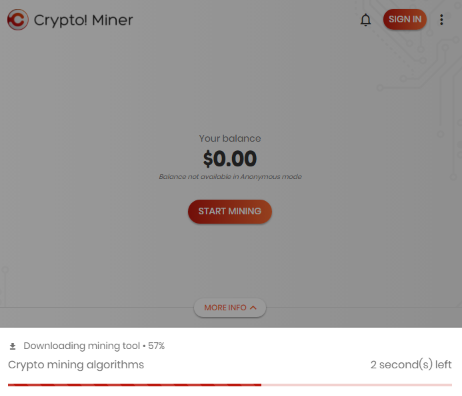 Download the latest version of the Crypto Miner here that includes a detailed logging enabled and some fixes. How do Instant Payments work? How do catch-up payments work? How does the Advanced Payment feature work? What is Tipalti and how does it work? Can I work for Freedom! ?